In this CD outing John veers off the beaten path by collaborating with his good friend Jim Wallace. The chemistry that occurs whan two accomplished guitarists combine forces is, first of all, exciting. It's also unpredictable. No matter what the concept was in the beginning, the music will take on a life of its own. This CD doesn't sound at all like the typical John Standefer album. And it's not like a John Standefer album + Jim Wallace either. It is truly a collaboration between the two players where both guitarists adjust their style - and the sum is greater than the parts. 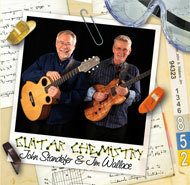 To read more about how this project came about please visit our special Guitar Chemistry: The Back Story page. View a different album by selecting it from the list below.